The new 180,000 square foot addition brings a variety of new functions to the USD Dakota Dome, including a 4,000-seat basketball arena, two NCAA basketball and volleyball practice courts, a weight room and training facility, science and health research facilities and classrooms, and a new club and viewing space for the Dakota Dome to the north. Meyer Borgman Johnson teamed with Sioux Falls, South Dakota-based structural engineers SEA to provide full structural design services for the project. MBJ’s primary project responsibilities include design of the building’s lateral system and long span roof structure, as well as partial demolition, renovation, and lateral system replacement of the south wall of the adjacent Dakota Dome. The south wall component of the project involves opening 100 feet of the Dome’s exterior walls to provide club viewing areas. Structural steel beams and braced frames support the openings. A retrofit lateral system, required because of the openings, replaces the current dome structure. 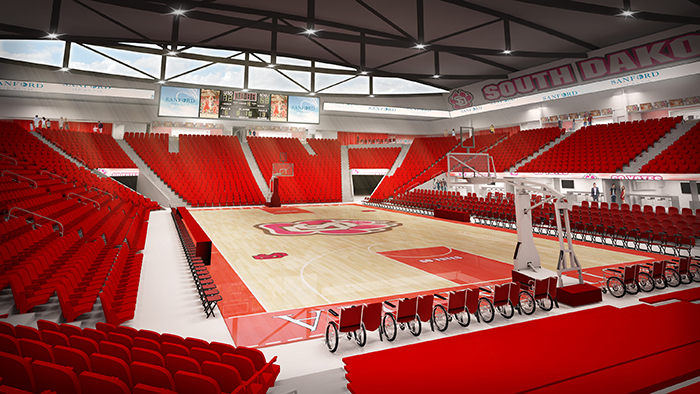 Three long span systems within the new addition include 205 feet in the arena, 80 feet in the weight training areas, and 63 feet in the practice courts.